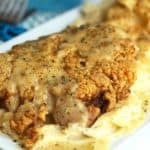 Chicken Fried Steak Recipe (Country Fried Steak) – Cube steak recipes are taken to a new level with this crunchy, crispy, flavorful and tender chicken fried steak recipe. It’s the best country fried steak on the web! Let’s talk Chicken Fried Steak. Arguably one of the most delicious, decadent foods that one person could ever eat. Fellow Southerners absolutely know what I’m talking about (I mean, how could you not?). But don’t worry, I won’t fault you if this is new territory for you because I’m more than pleased knowing its about to change your life. First, let me give you a little background info. Chicken fried steak is a dish in which a cut of beef, usually thin and from the round, is breaded and fried. You can also find it made from pork as well. It’s preparation is about the same as that of fried chicken, which is how it got its name. WHERE DID CHICKEN FRIED STEAK COME FROM? The origin of chicken fried steak, also known as country fried steak or pan fried steak, is very interesting. Recipes for batter-fried steaks can be found in various Southern Cookbooks that date back to the early 1800’s. Before modern food safety practices and methods of food storage, making inexpensive and tough cuts of meat was a necessity; breading and frying always did the trick. This Southern delicacy is so popular now that it’s served almost anywhere, from diners to five-star restaurants. It can be prepared in several ways, from burgers to breakfast platters. It is still prepared with tough cuts of meat; however, there are also other varieties made with rib eye or tenderloin. Today, you can enjoy the battered steak throughout the USA, but the states with the best-known recipes exist exclusively in the South. There’s something comforting and addictive about warm fried meat under thick gravy served with your choice of vegetable and buttery mashed potatoes. There’s nothing else in the world quite like it. There are few things in this entire world that I remember loving more than Chicken Fried Steak. I know that is a very lofty statement which you might think has a hint of exaggeration but I can’t begin to tell you how true that statement is. Even to this day, when it’s raining outside, I’ve had a bad day or I’m missing a bit of home, I reach for this recipe. It’s comfort compares to no other; each bite truly soothes the soul. For others, it might be a bowl of mac and cheese or a slice of chocolate cake, but I like to think they just haven’t had chicken fried steak yet. At least not the way I make it. The funny thing is my mother never made a chicken fried steak recipe. Neither did my big mama. So where did this obsession for chicken fried steak come from? Well it actually came from a random southern restaurant I had the dish at when I was a kid. The rest as they say is history. Each year after starting around the age of 7, I wanted chicken fried steak for my birthday so we went everywhere from Cracker Barrel to Chili’s so I could have it. When I became an adult, I realized I could make it at home. I hunted endlessly for the perfect recipe, trial and error became my best friends. At times the meat was too tough, the breading wasn’t crispy enough or it just needed more salt. But no matter how many times I failed I kept trying in hopes that eventually I’d have exactly what I was looking for. And guess what folks, I’ve got it. This is my favorite recipe which I developed a few years ago. If you have any cube steak lying around, this is a great way to use it. It is my dream Chicken Fried Steak recipe y’all. With cube steak recipes, it must be tender and well seasoned with a perfectly golden brown crispy crust. You won’t believe how great you can become at frying steak. I prefer a cube steak because it has already been tenderized by being beaten with a mullet. Each bite breaks down much easier this way. This country gravy has bits of onion, garlic and spice. 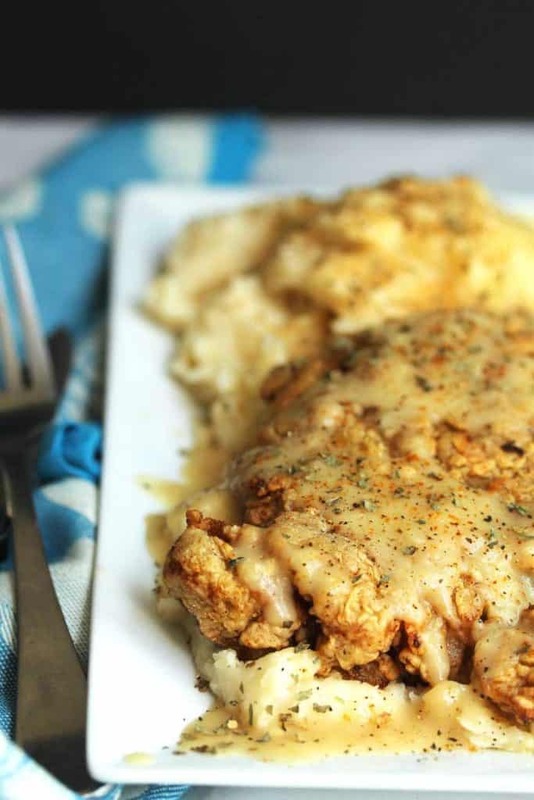 Most chicken fried steaks have a white gravy and that’s what you will mostly find here. Because I added additional spices, it tints the color just a bit. You can also brown the roux made here a bit more to add more flavor and color if you would like a brown gravy but the traditional way includes a lighter gravy like the one pictured here. No matter what way you choose to make it, I assure you that it’ll be crazy delicious. The gravy’s texture is smooth and rich, don’t even get me started on the way it coats your mashed potatoes. Each bite melts in the mouth and the flavor balance out perfectly. 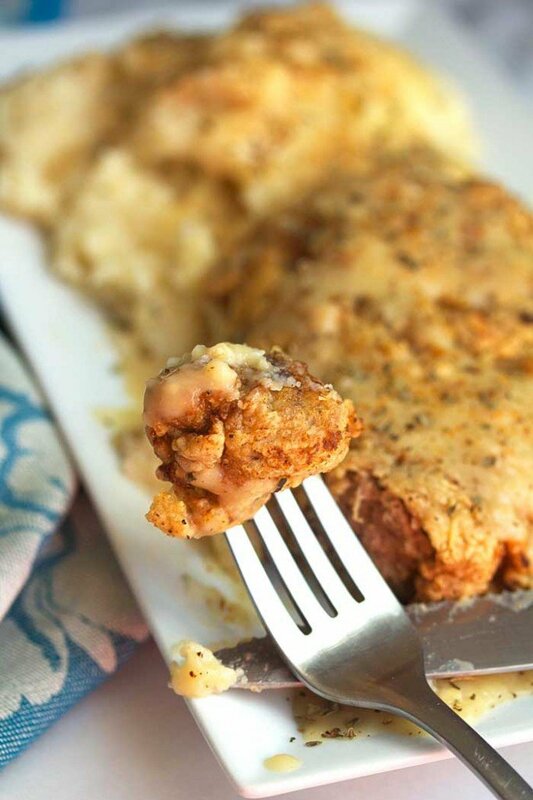 Add your favorite mashed potatoes along with my easy homemade garlic bread, and this is perfect chicken fried steak recipe in every sense of the phrase. I no longer crave this because I make it right at home whenever I want, and boy oh boy is it delicious! 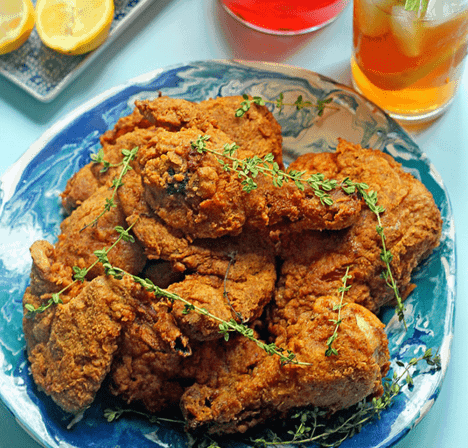 You can also make chicken fried chicken starting with this fried chicken recipe. 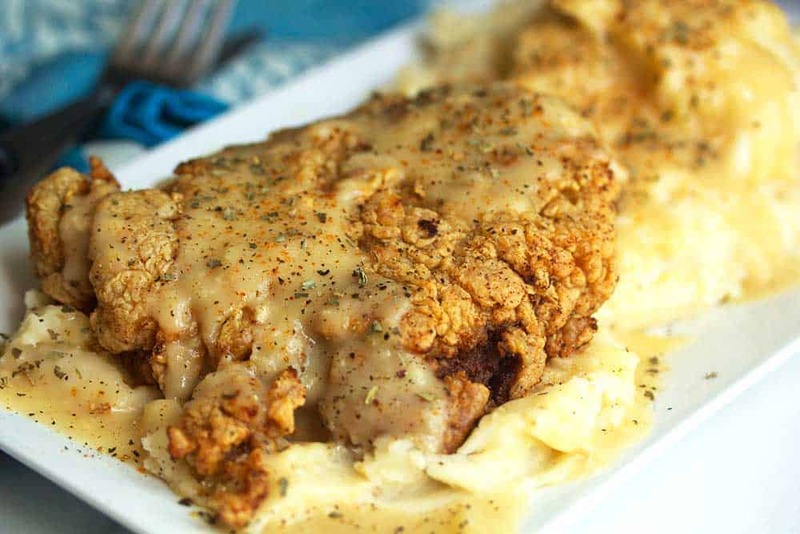 Chicken Fried Steak Recipe (Country Fried Steak) - Cube steak recipes are taken to a new level with this crunchy, crispy, flavorful and tender chicken fried steak recipe. It's the best country fried steak on the web! To a large bowl, whisk together buttermilk, eggs, hot sauce and Worcestershire sauce. To another bowl, whisk together flour, cornstarch, salt, garlic powder, pepper, and cayenne. Dip steaks, one at a time, into seasoned flour mixture coating each side then back into marinade then back into seasoned flour then finally place on a baking sheet. Place in the refrigerator for 15 minutes. Add oil to cast iron skillet or frying pan and heat oven medium high heat. Also preheat oven to 250 degrees. Once oil is hot and ready, fry each steak on each side until golden brown. Drain on paper towels then place steaks on parchment covered baking sheets and put in the oven while you make the gravy. Add 1/4 cup of the oil from frying to a saute pan over medium. Add in shallots or onions and garlic and cook for 2 minutes while stirring. Next stir in flour and cook creating a roux (think a delicious light brown color). Cook until browned (but not burned). Stir in milk and stock and turn heat up to high heat until boiling then turn heat down to medium low and allow to thicken until it coats the back of a spoon. Turn off heat and spoon gravy on top of steaks. Sprinkle with ground pepper and parsley and serve hot with mashed potatoes if you prefer. Also remember if you aren’t into country fried steak or chicken fried steak, try my fried chicken!!! I made the Chicken Fried Steak this evening for our dinner. It was delicious.. will definitely make it again. Thank you for sharing the recipe. One day we will be seeing your little one on TV doing her own cooking show! She is adorable! You are so kind! Thank you Brenda! This recipe can be oven fried but it truly is better fried. I would consider it a cheat meal. I just got a cast iron skillet and I knew my first meal cooked in it would be CFS! I remember one time my mom made it and I was worried because it had hot sauce in it. I don’t really like hot sauce but I love spicy. I saw that your recipe had HS and Cayenne and I decided on this one! Best choice ever! This is the most flavorful CFS I have ever had and I didn’t even make the gravy. This will be my go-to recipe! Can this be made/cooked and then frozen for freezer meals? How long do you fry the steak just till brown?? Until brown! It easiest cooks through because it is thinned out. OMG I already have your cookbook but here I am printing off all kinds of recipes! CFS is one of my fave foods of all time! Here in Texas we love a cream gravy on ours- very simple with no broth- just flour, milk, residual oil, S&P, maybe some onion & garlic powder. Do you think it would still be tasty if I subbed the broth for the same amount milk? (2 c total) I’m sorry if this has already been asked- I did not have time to read all the comments. Thank you so much! Absolutely! Knock yourself out and make it your own! We live up here in Canada and we have very few restaurants that serve Chicken Fried Steak. Whenever we visit the USA, my husband always orders it. Thanks for sharing your recipe as the whole family loved it and the kids said it is definetly a keeper!! I used this exact recipe except for one thing. I only had thin cut ribeye steaks on hand. 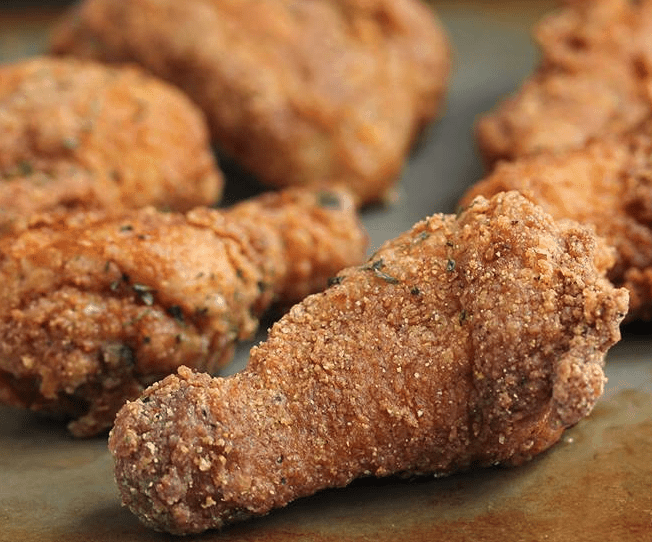 Oh my….tender plus crispy. Your recipe is a keeper. I know it isn’t traditional, but try it with the thin cut ribeye. Once pounded out, it is amazing! Thanks for the recipe. Wonderfully tasty! Hooray fantastic! Yes you definitely want to refrigerate the steaks next time. I’m a NYC girl trying to impress my Oklahoma born hubby and he scored this a 5+. “It’s the best I’ve ever tasted “. I’ll take that as a compliment as he’s over 70 and has lived most of his life in Oklahoma and Texas! I doubled the recipe while hoping the finicky grandkids would enjoy it as well. When the 6 year old asks if we can make it again, you know it’s a success! I followed the recipe exactly and we wouldn’t change a thing except to make extra. OMG That makes me so happy! This recipe is amazing!!! I’ve always had trouble with chicken fried steak coming out tough. What ingredients in this recipe will help the steaks become tender?? You definitely need to beat your steaks or make sure they are pre tenderized. Wow! This was an amazing recipe! the entire family loved it! Hooray I’m so so glad!!!! And t he CFS is tender without baking after frying. Is t he CFS tender without baking after frying? Yes it is tender. You want to make sure it is a tender cut of meat beforehand. Made this last night! Sooooo good! Love this recipe! Can this be made in quantity? Can it be dipped and breaded and then frozen? I’m thinking of serving this at our club, but would have to serve maybe 40 dinners. Thanks Jocelyn!! Love your site! Hi Nina, thanks for the sweet compliment. I have actually never tried that so I can’t even recommend if that would be a good idea unfortunately. It may not turn out as crispy or cook all the way through if it is frozen. Can you use just milk and not buttermilk? I tried this recipe last night and it was ummmmmm good… I did mines with thin cut chicken breast…thanks for the recipe…? Fantastic! I really am so glad you enjoyed it! Made this last night and it was delicious. Everyone loved it. Will be putting this in my bi-weekl rotation. Thanks for the recipe! Hooray! I’m so glad to read this. Thank you for sharing. This recipe is definitely a keeper. I added a pinch of smoked paprika to the gravy. And it was out of this world. Made this for my family tonight… Amazing!!! I love making chicken fried steak and so far this is my favorite ? Delicious Grand baby Cakes!!! Fried ’em up golden brown and the family loved them. Thanks for sharing. The flavor for these is AWESOME and I only let it marinate for 1 hour! I give this recipe 100 stars!! I will definitely be trying this recipe again soon. I think it would be helpful for inexperienced fryers (like me lol) to add a few frying tips to the end of your recipe. A few of mine came out undercooked, soggy crust, or really chewy because I didn’t know the importance of oil temperature and amount of time to leave the steaks in for. This is a really great recipe and I look forward to checking out the rest of your website! That’s a great idea regarding the tips. I am so so glad you enjoyed the recipe so much. I think I am adding it to my cookbook so I will be retesting it and making it better. Thank you again for the sweet message and make sure you rate the recipe using the stars! Made this last night for the family. They love it and said the the gravy tasted like restaurant quality. Thanks for a great recipe. Hooray I’m so so glad your family enjoyed it! Made this tonight and it was AMAZING!! My husband said it was the best he’s ever eaten. We didn’t even eat with gravy!! I’m so so glad you enjoyed it!!! Hooray!!!! WOW! That looks good. I have made chicken fried steak many times, but not like this. I found your recipe on Pinterest, and so glad I did! I never seen your blog or even on tv (I seriously don’t know where I’ve been). But I plan to come back more often. Bookmarked, saved, and pinned! When I flour my steak i press the flour into the meat to build a nice thick crust. I’ve never added cornstarch to my flour but today is the day! Thanks for sharing. Do you have a recipe for greens??? Simple southern food makes my heart happy. I’m so glad you are enjoying the recipe. I will be sharing a recipe for greens in the near future though I have been holding back for my next cookbook. Let me know how it turns out for you. I must try this…I love a good chicken fried steak, but I’m going to go for it with hash browns and s rambled eggs for breakfast…no wait, mashed potatoes, corn and a salad for dinner…ok, BOTH! Thanks for sharing!